My latest project-in-between-projects are the designs for the popular double bill by Mascagni and Leoncavallo, Cav & Pag. If you haven't guessed already this is for Mascagni's Cavalleria Rusticana. 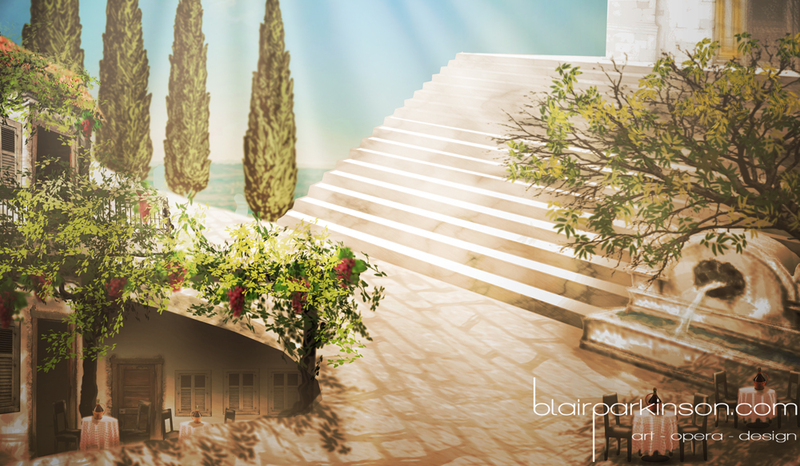 The intention here was to express the light and brightness of the Sicilian sunlight and contrast the more rigid aspects of the church with the more earthy nature of the characters and landscape surrounding it. As far as recordings go I have to say that out of all that I listened to for research, the one I keep coming back to is the Decca early stereo with Bjorling, Tebaldi and Bastianini. Yes it's orchestra and chorus are rough and ready, but to me that's all part of the Cav/Pag package. Plus you get three principals in their absolute killer prime. Tebaldi's Easter Hymn is absolute magic. Next up, I Pagliacci, so stay tuned.